Potent, selective PKC inhibitor (IC50 values are 0.0084, 0.0180, 0.210, 0.132, and 5.8 μM for α, β1, δ, ε and ζ isoforms respectively). Potent GSK-3 inhibitor (IC50 = 360 nM). 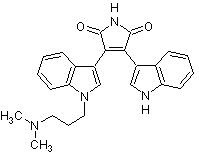 Potent 5-HT3 antagonist (Ki = 29.5 nM). Shows anti-inflammatory effects in vivo. 1.5 x 10e7 THP-1 cells were incubated with 100 nM GF 109203X (ab144264) or Ro 31-8220 mesylate (ab120374) for 30 minutes prior to activation with 10 µg x mL-1 PMA (Sigma) for 4 hours. Control cells were left without inhibitors or PMA. Cells were lysed in 1 mL of lysis buffer, and 30 µL were tested for PKC activity (duplicates; +/- SD). Publishing research using ab144264? Please let us know so that we can cite the reference in this datasheet. There are currently no Customer reviews or Questions for ab144264.